Get ready for a mix of hot temps, showers, and sun this week. Although the official start to summer is still a few days away, it certainly feels like it already. The temperature reached the mid-80s in most communities on this Saturday. Sunday will also be very warm, but there will be a sea breeze that develops during the afternoon. Temperatures along the coast will be in the low 80s, but inland highs will hit 90°. Humidity levels will begin to increase during the afternoon and evening. 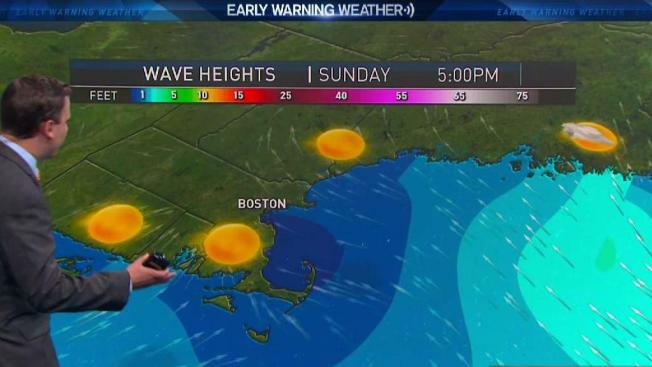 Monday, record-breaking-to-potentially dangerous heat is expected. During the winter, you hear us talk about wind chills. Wind chills take into account the air temperature and wind speed. During the summer it’s the heat index, which takes into account the air temperature and humidity. The heat index on Monday will climb between 100° and 105° in most communities. Actual temperatures will climb into the mid to upper 90s. Portions of the Connecticut River Valley and Merrimack Valley may hit 100°. The exception to the extreme heat will be the Cape and Islands. Showers and potentially a few strong thunderstorms will be possible Monday night into Tuesday morning. Temperatures will cool off into the 80s on Tuesday. Once clouds clear Tuesday afternoon, it will turn into a nice day. Warm, summery weather will stick around for the remainder of the forecast period. On and off showers and thunderstorms are possible, but significant rain looks unlikely over the next 10 days. Monday will be very hot.